When the temps are rising, the last thing you want to do is turn on the oven in the kitchen. 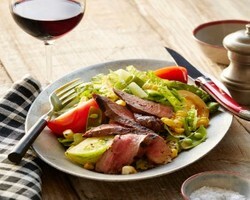 For a great entree salad, try this crunchy summer salad topped with grilled steak—marinated in Temecula Valley Zinfandel. It gets its zing from a spicy-mustard vinaigrette. For the ultimate pairing, be sure to serve it with your favorite Temecula Valley Zinfandel! Pour the mixture into a medium glass bowl and mix in the Worcestershire sauce, soy sauce, black peppercorns, cayenne, and 1 tablespoon of the dry mustard. To make the vinaigrette, whisk the spicy mustard in a small bowl with the vinegar, olive oil, sugar, salt, pepper, and the remaining teaspoon of dry mustard. Slice the steak across the grain into ½ inch strips. Recipe and photo courtesy of the Wine Institute of California. In Temecula Valley Southern California Wine Country, the family that wines together, stays together. At least that’s what it seems like given the number of family owned and operated wineries that populate the region. What started out as Marcelo Doffo’s retirement project slowly evolved into a full-fledged, family-owned and operated winery, Doffo Winery, known for producing small-lot, hand-crafted reds. 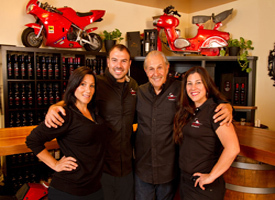 Upon his official retirement on January 1, 2016, Marcello turned the business over to his three children to run it. Son Damian serves as acting CEO and winemaker, and daughters Samantha and Brigitte serve as event coordinator and tasting room manager respectively. The Doffo family shares many things, but most importantly, they are unified in their belief that quality winemaking starts in the vineyard. To this end, they hand-plant vines, meticulously prune and even play classical music for their vineyards to “soothe the grapes.” They also share a love of motorcycles. The Winery is home to MotoDoffo, the family’s private collection of over 100 racing and vintage bikes. The Wilson Family opened Wilson Creek Winery because they all wanted to be together after parents Gerry and Rosie Wilson retired. Originally from Minnesota, the Wilsons had no experience as vintners other than making dandelion and rhubarb wine in their basement in the 1960s. 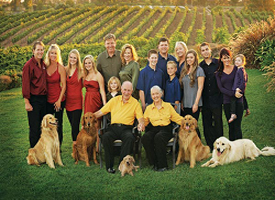 Today, Wilson Creek is one of largest and most widely recognized wineries in Temecula Valley, and still run by family. Bill Wilson is CEO; Mick Wilson is COO; Deanna Wilson works in sales and distribution and Jennifer Wilson works in merchandising. The family can regularly be found on the grounds, meeting customers and working closely with winery staff. All would say Gerry and Rosie are the glue that holds everything together. Some wineries are a union of not one but two families. Gary Winder started Stage Ranch Farm Management Inc. (parent company of Temecula Valley Winery Management) in the early 1970s. He was joined by Mike Rennie in the 1990s and together they focused on growing their vineyard operations, ultimately founding Leoness Cellars in 2002. Leoness is largely run by their families, including Rebaux and Jesse Steyn, Gary’s daughter and son-in-law. The staff describe the team as “more of a family group” than a traditional collection of employees, which they attribute to their unique family dynamic. Be sure to visit these and other Temecula Valley Southern California wineries this September, during California Wine Month. For more information, visit www.winemonth.org. 1. The Restaurant at Leoness Cellars favors the sensational figs now in season with their Fig & Goat Cheese Summer Salad. Dive into delight with this seasonal selection of mixed baby greens, julienne of carrot and cucumber, sliced red onion, baby tomatoes, house made candied nuts, with white balsamic dressing and fried prosciutto garnish. This salad pairs wonderfully with Leoness Cellars’ 2015 Viognier. 2. Meritage at Callaway Vineyard & Winery offers a unique twist on the traditional California fruit with their Beer-Battered Avocado Salad. This summer salad includes locally-grown wild arugula, Gorgonzola, and whole cloves of roasted garlic. These ingredients are tossed with a crisp house made vinaigrette dressing and are then plated with large pieces of beer battered avocado. A surprising wine to pair with this plate is Callaway’s 2012 Special Selection Mourvedre. 3. Vineyard Rose at South Coast Winery has created a juicy and refreshing selection of locally-grown ingredients for their Heirloom Tomato and Harry’s Berries Salad. The new menu feature includes a perfect balance of makes this salad paradise on a plate. South Coast Winery’s 2011 Grenache is an ideal pair for this lovely salad. 4. Annata Bistro at Mount Palomar Winery welcomes a warm afternoon with a strikingly colorful display of refreshing produce in the perfect seasonal Citrus Salad. This exquisite summer selection contains fresh and creamy Burrata cheese, blood orange, naval orange, grapefruit, purple and green kale, striped beets, extra virgin olive oil, and a white balsamic reduction. This particular summer creation is only available on the weekday menu (Monday-Thursday). This salad pairs incredibly with the slightly sweet 2013 Cinsaut Blush. 5. Creekside Grille at Wilson Creek Winery serves a light and imaginative Cucumber, Melon, and Heirloom Tomato Salad. The leaf crown lettuce head is topped with local, organic cucumber, melon, tomato, sweet onion, and feta cheese with a homemade raspberry vinaigrette. Wilson Creek’s Sparkling Rose is the predictable yet sensational recommended pairing. Holiday Gift Giving ~ Temecula Style! Need that perfect holiday gift?? 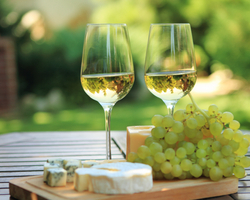 We’re sure that nothing would be appreciated more than a little something from Temecula Valley Wine Country! What could be better than sipping wine while shopping for everyone on your list? Our Temecula Valley winery gift shops offer unique and charming wine-themed gifts, specialty food, home decor and, of course, wine! Not only does wine make the perfect gift for friends, neighbors and family, but it also makes for a great host gift or corporate gifts. You can purchase by the case for the best price! Besides wine, wine club memberships make excellent gifts! Most Temecula wineries offer affordable wine club memberships with year-round benefits such as free wine tastings, VIP pricing on wine and special events, pick-up parties and more. If you’d prefer to shop online, many wineries offer the ability to sign up for wine clubs online. Of course, wine can also be purchased online and shipped to most states. Or, perhaps, you’re just looking for wine for your holiday gathering. Many of our wineries offer festive white and red dessert wines, either late harvest or port-style. Some festive wine options include: South Coast Winery’s sparkling wine line, Thornton NV Cuvee Rouge, and Callaway’s Late Harvest Cabernet and dessert wines. Be sure to check out Wilson Creek Winery, which offers white, red, and sparkling wines with custom and personalized holiday labels. Happy holidays from Temecula Valley Wine Country! We look forward to celebrating with you soon. Posted in Holiday Events, Winery Specials & Deals | Comments Off on Holiday Gift Giving ~ Temecula Style!